This year, the PGH International Women’s Strike Coalition will work alongside the Women’s Law Project to highlight the urgent need for paid sick leave in Pittsburgh, especially among women who work low-wage jobs, women of color, queer and trans women, parents, caregivers, disabled people, and victims of domestic and sexual abuse. The Women’s Law Project just filed an amici curiae, or friend-of-the-court brief, formally supporting the city of Pittsburgh and SEIU in asking the PA Supreme Court to allow the earned paid sick days ordinance to take effect. Research backs up the common-sense assertion that access to paid sick days is likely to reduce the spread of illness—especially during widespread outbreaks of highly contagious illness. Currently, deaths from influenza and pneumonia were responsible for 1 of every 10 deaths in the United States, and that’s likely to rise, according to the Center for Disease Control (CDC). Currently, more than 4,000 Americans a week are dying from the flu and pneumonia. This season, there have been 7,500 confirmed cases of influenza in Allegheny County alone. Pittsburgh City Council passed an earned paid sick days ordinance back in 2015. However, paid sick days are not in effect because the Pennsylvania Restaurant and Lodging Association sued the city of Pittsburgh to stop the policy. Under the ordinance, employees would earn one hour of paid sick leave for every 35 hours worked. Businesses with fewer than 15 workers could cap the amount of paid sick time at three days per year. Employees at larger businesses would be able to earn at least five paid sick days each year. It’s ironic that the restaurant industry is the industry leading the fight against paid sick days in Pittsburgh. A lack of paid sick days is especially dangerous to the public health when sick restaurant workers go to work, a situation that happens every single day in Pittsburgh and across the Commonwealth. In a national survey of more than 4,300 restaurant workers, 88% of those surveyed reported not having paid sick leave, and 63% stated that they cooked and served food to customers while sick. In another survey, 12% of interviewed restaurant workers reported working while experiencing diarrhea or vomiting on two or more occasions in the previous year. Almost half of those who worked while sick reported that they did so because they “can’t afford to lose pay.” In one study drawing on data from the CDC, where factors contributing to food contamination were reported, infectious food workers were implicated as the source of contamination in 70% of the cases. Is this really want we want for Pittsburgh? For restaurant workers to be serving drinks and plates of food between bouts of diarrhea and vomiting? 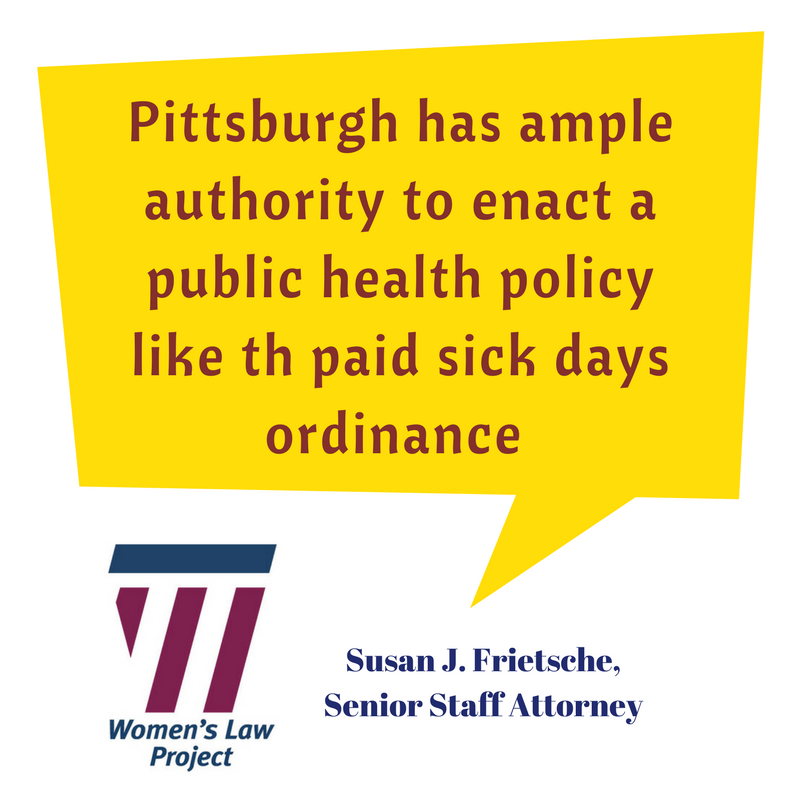 WLP’s analysis concludes that Pittsburgh has ample authority to implement a public health policy such as a paid sick days ordinance. Pennsylvania Restaurant and Lodging Association is not fighting paid sick days on public health grounds. Instead, they are arguing that Pittsburgh’s status as a second-class city means it can’t regulate paid sick days according to the Pennsylvania state constitution. The Women’s Law Project just filed an amici curiae, or friend-of-the-court brief, formally supporting the city of Pittsburgh and SEIU in asking the PA Supreme Court to allow this critical law to take effect. The law is clear that Pittsburgh can implement this policy. The brief has been signed by 50 additional organizations. 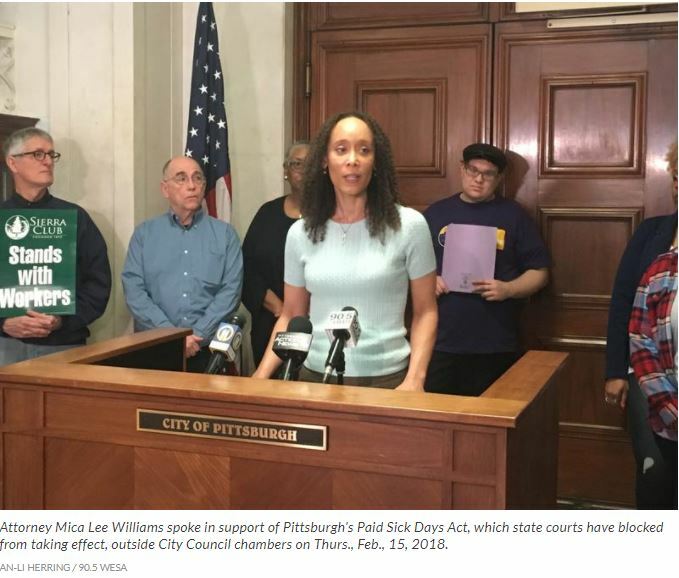 As the case continues to wind through the courts, 40% of private employees in Pittsburgh still do not have a single day of paid sick leave, forcing sick workers to choose between a paycheck for the day and risking spreading infectious disease. For more information or to discuss this case with a WLP attorney, contact Tara Murtha at tmurtha@womenslawproject.org or 215-928-5766. WLP is a non-profit organization. Please consider supporting equal rights for women and girls by making a one-time donation or scheduling a monthly contribution.